Below are 2 pictures that we thought were of Blondina (Kusel) Jarvis because her name was on the back side of the photo on the left. 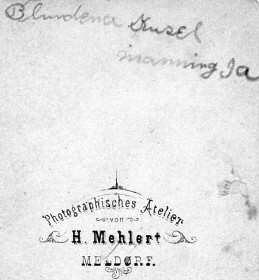 Ralph Zender (son of Ida (Kusel) Zender -- Ida who was a sister to Blondina) told me that this wasn't Blondina Kusel who married Blair Jarvis. 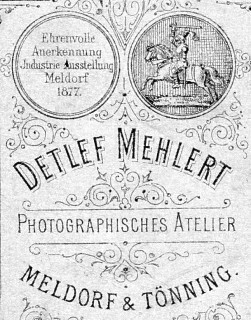 After more careful examination on the backside of the 2 pictures we see that these 2 pictures were taken at the Mehlert Studio in Germany. The towns of Meldorf & Tönning are in Schleswig Holstein. The picture on the left is an older image and the picture on the right is of the same couple (we think) taken many years later. Both pictures were taken at the Mehlert studio. These pictures have been handed down in the Kusel family. 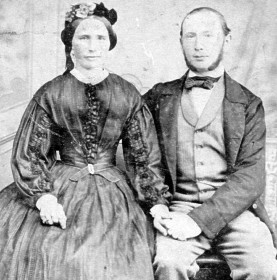 The picture styles are from the era of Friedrich Kusel -- Friedrich was born in 1819. The same thick paper and brown colored images. Meldorf & Tönning are in Schleswig Holstein half way between Husum & Heidi (north & south) near the North Sea. 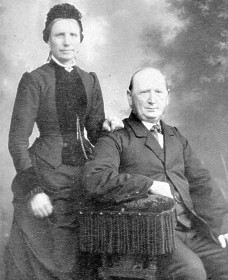 Assuming these are Kusel relatives the pictures were taken a long way from Friedrich Kusel's origins in the Lenzen area of the German State of Brandenburg. Another possibility is these pictures are of Blondina Kusel's in-laws such as her husband Blair Jarvis' parents. Below is the family tree to use as a perspective. We believe the unknowns belong in generation 3 based only on the style/age of the picture. Generations 1 to 4 were born in Germany & generation 5 was born in the US. Friedrich Kusel's generation (3) was the first to come to the US. Friedrich Kusel Catharina Meinecke 3 Man & Woman above?